Selfkant Village Schalbruch - Beloved Home ! The elderly Schalbruch residents, who have lived through nearly the whole of this century, can tell stories of peat preparation and broom making, of working in Homberg, of the Wars, of poverty and of school and church building. But the history of the village began centuries earlier. Evidence from earlier centuries can be found in some houses that did not either fall victim to the Wars or get torn down. From archives one can see that the village must be even older that the oldest building would suggest. Since 1732 church registries have reported marriages, births and deaths in Schalbruch. Around 1550 the “rebaptist” movement surfaced in Susteren. Duke Wilhelm von Jülich sent the Aachener Dominican Matthias von Sittard into the endangered villages, to minister to the faithfull in the old religion. The famous preacher also preached in Schalbruch. The history of Schalbruch could be quite related to that of the “rebaptist” movement. It is possible that the group went to Schalbruch for protection from pursuit. The nature of the surrounding landscape made Schalbruch a good place to hide. In a rather flat countryside, Schalbruch lies in a valley. This valley was really not very inviting to settlement. The marshland had always lent itself as a place to hide. The people who lived here between 1550 and 1650 were considered to be fools, because they resisted both the civil authorities and the Catholic Church. Because of this uncomfrotable and at times dangeroujs life for chose who were of another religious denomination, people from outside the village were called “Shauter”. The nickname “Schauterbrook” was coined. The name Schalbruch could have been related to the valley area, because the people in the surrounding villages peeled (schälen) the bark from trees to use for tanning. North of Schalbruch there is a valley with an old tributary of the river Maas. This valley is part of the larger valley of the Maas, which is on the Dutch side of the border. Before the marshes were dried out in the previous century, the villagers often ice skated here in winter. In May the Schalbrucher peeled the oaks. The rind was used as tanning oil. One month later, peat was cut into square pieces and dried. The peat was used for heating. The oldest vital statistics record from Selfkant are from the year 1798. The area was under French authority at the time. In 1799 Havert, Isenbruch, Schalbruch and Stein together had 983 citizens, of those 300 were children under 12 years of age. Several men from Schalbruch fought as soldiers under Napoleon. After the Congress of Vienna the area was placed unter the government of Prussia. The population grew to about 1200 in the four villages. In the mid 19th century streets were paved in Schalbruch and stone water canals were built. The Haverter Way became the shortest connection from Schalbruch to the church in Havert. The villagers tried to dry out the valley and to cultivate it. The cummunity of Havert tried in the spring of 1857 to plant oats, good grass and clover, but the weather did not cooperate, and the effort failed. The next year the community was able to get 1,268 Taler (our word dollar comes from German Taler) from the sale of the oats they were able to raise. Beginning in 1859 basket meadows were planted. But the trial failed, and was discontinued after several years. The Nazis decided that the valley should be dried out. They spent a lot of effort doing so, but were able to convert the marshland to grazing and farmland. In honor of the Mother of Sorrows a chapel was built in 1864 at the east end of the village. 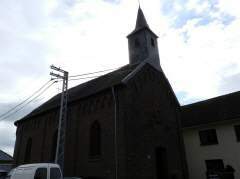 Five years before, the community of Havert had already purchased for five Taler and 15 Groschen a terrain of five Ruthen and 90 feet from the Lemmens siblings for the erection of a house of worship. The villagers of the upper village baked the bricks from their own clay earth. After the first World War a memorial was built in the school street of honor the dead and the victims of crime. 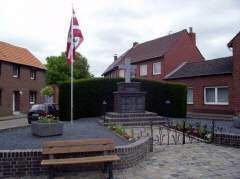 Because a meeting room was build near the memorial, the Pastor of the parish in Havert demanded in 1933 that the memorial be moved to the current location between the lower and upper High Streets. The memorial has kept its use in memory of Schalbruch citizens, and has been regularly repaired by them. The community comes several times a year here to pray. two-grad elementary school and an apartment for a teacher. The Schalbruch community had to give 90 Hectares of land to Havert for the school. The school was quickly built, so that Easter 1900 classes could begin. In the school year 1967/68 the children from Isenbruch were integrated into the Schalbruch school, and starting in August 1968 also the children from Havert and Stein. 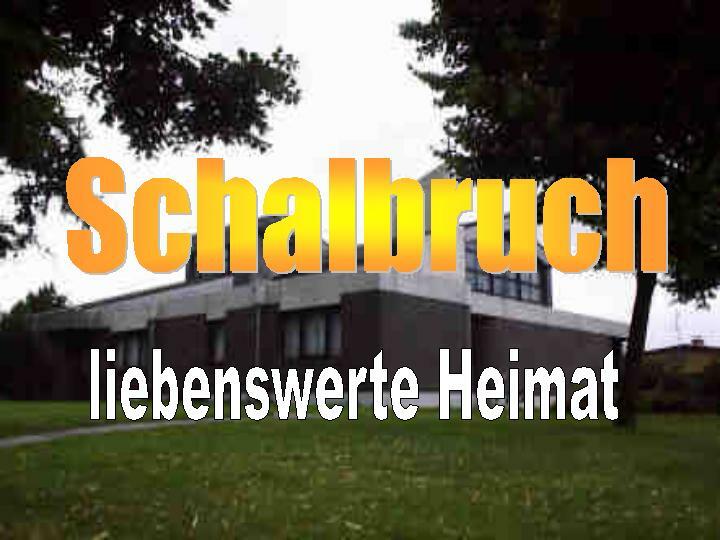 Grades one, three, five and six were taught in Schalbruch, grades two, seven, and eight were taught in Isenbruch. 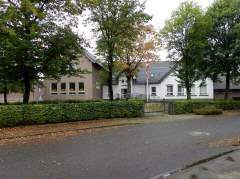 With the completion of the grade school in Höngen in 1971, the old grade school was closed, and the grades five to eight were sent to that school. 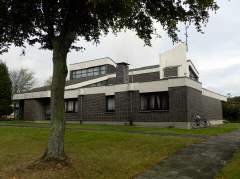 Since the 1975/76 school year, the elementary schools in Saeffelen and Schalbruch were combined as the elementary school Selfkant II. Nearly 100 years after the Schalbrucher school was built, it was renovated and enlarged. The previous park playground for children was integrated into the school playground. The expansion was dedicated on October 27, 1996. The school serves as four grade elementary school. At the beginning of the 20th century many of the Schalbruch citizens worked at a factory in Oberbruch that opened in 1910 and made waxes and polishes. The time between the wars was a very turbulent one. Shortly after the rebuilding effort, inflation set in. At the end of 1923 the currency value had fallen so far that in Germany a Dutch Gulden cost 18,000 Marks. Many Schalbrucher tried to find work in the Dutch coal mines and brick factories, as well as on farms. During the second World War many Schalbrucher had to serve as soldieres. 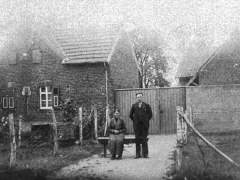 As the front came closer, the villagers were evacuated into neighboring Holland and as far away as Thuringia. At the end of the War Schalbruch was on the front line for four months. Nearly every house was damaged. Many Schalbrucher lost their lives in the War and as prisoners. Their names are engraved into the memorial. After the War there was a lot of repair to be done during the time (1949 to 1963) in which the area was under Dutch control. A new forested area was created, called “de Busch” in local language. The streets were tarred. In 1963 Dutch rule ended. In 1966 the local vote selected Schalbrucher Franz Diecks as mayour of the Community of Havert and Schalbruch was connected to the communal water system. 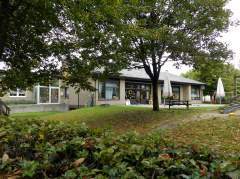 In 1974 Schalbruch opened a Kindergarten - today in the immediate vicinity of the school and church. Behind it the village meeting place was created. The paving of the streets around the church and Kindergarten was completed by the Schalbrucher themselves. In addition to the children from Schalbruch, children from the neighboring villages of Isenbruch, Havert and Stein attend the Kindergarten. Parents and volunteers planned and completed the surrounding landscaping. The village clubs have been recently busy in the basement completing a youth center and another room for club and village use. 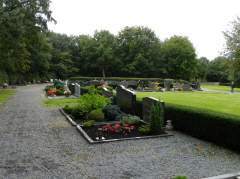 Another accomplishment of the 70s is the Schalbrucher cemetery. On this subject, the former mayor Heynen declared at the 1978 shooting festival: “On the once barren and unseemly Heisberg one of the most beautiful resting places of the Selfkant was created.” In 1977 additional improvements were made, such as sewer and street upgrades. The Haverter Weg, the only road into the villages, was straightened and opened to public transportation. Around the little island northwest of the village, beneath the Rastberg, stretching toward Echt, there is an wildlife preserve. Hikers and bikers use the forest and the valley which extends across the border into the Netherlands. The highest elevation of Schalbruch is between 30 and 55 meters above sea level. Schalbruch offers every hiker and vacantioner a wonderful flora and fauna. Our home, Schalbruch, has about 900 inhabitants. Only a few work in agriculture. Mining has also pulled out of the region. With the high variation in jobs that has arisen, most Schalbrucher find it self understood that they will have a more or less long drive to their place of work. With this change, however, the average income of the villagers has grown. The cultural village life is formed not only by the Kindergarten, the school or the church, but also through the local clubs.